Every Christian wants to be more like Jesus—and, wonderfully, that's what God wants for us too: "It is God’s will that you should be sanctified" (1 Thessalonians 4 v 3). How will that happen? Only by asking God to transform us from the inside out—because real heart change comes not by our own willpower, but by the Spirit's power. Too often though our prayer lives are reduced to shopping-list-style-requests or desperate pleas to get through the day. 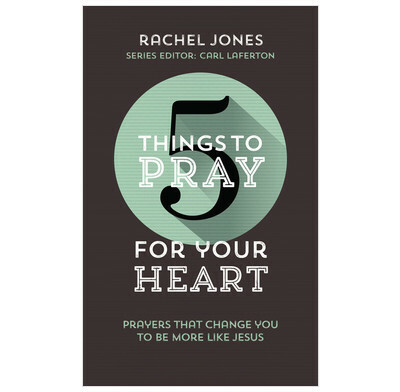 But this little guide will help you to pray for genuine, deep and astonishing Christian growth, in your own life or somebody else's. These are prayers your heavenly Father loves to answer—because they're based on his word. Each spread takes a passage of Scripture and suggests 5 things to pray for a particular area of your Christian life. Because when we pray in line with God's priorities as found in his word, our prayers are powerful and effective (James 5 v 16)—and that's a truly thrilling prospect. Use this book in any number of ways: work through it as part of your daily quiet time, or pick it up whenever a particular need arises. Ever drift off while praying? Ever feel you should do better than a prayer shopping list? This is a Wonderfully practical book. I can’t think of anyone this would not help. Takes us to scripture and guides us in praying to our loving Father for things that really matter. For “A good man brings good things out of the good stored up in his heart”. I heartily recommend this and the rest of this series. I have found this book very helpful in directing my prayers for my own growth, development and devotion. The topics are relevant and the scripture texts give a solid foundation. I've found a day's portion to be just the right length, neither too brief nor too long-winded, and have really enjoyed and looked forward to my reading each day. I would certainly recommend this book for anyone wanting to pray into areas they might not have specifically covered before, and I will be checking out the other books in the series soon.